Facebook announces Year in Review data – the most talked about topics on the platform for 2016-singers, senators, shark and sports were the topics that got the 15 million Australians who regularly use Facebook sharing in 2016. Year in Review top 10 lists were measured by how frequently a topic was mentioned in Facebook posts made between January and December 2016. To compile this list, Facebook posts were analysed in an aggregated, anonymised way, and then ranked to create a snapshot of the year on Facebook. Globally, on Facebook, from the day Ted Cruz announced his candidacy back on 23 March 2015 through to election day, 289 million people generating 10 billion interactions (that’s likes, comments, shares and original posts). Whilst this data spans more than just this year, the fact that the US election did not feature in the top ten most talked about topics by Australians in 2015 suggests that 2016 was the year that got Australians most engaged about the election. For the second consecutive year, Malcolm Turnbull came in as second in Facebooks’ year in review data. And the only other Australian politician to join him in the list this year was Pauline Hanson (#6 Pauline Hanson). Last year, the other politician to join Malcolm Turnbull in the top ten list of 2015 was Tony Abbott. During the ten week election campaign, Malcolm Turnbull was consistently the most talked about politician on Facebook and Pauline Hanson rose to become the third most talked about politician during the election, behind Turnbull and Shorten. Ms Hanson featured in one of the most viewed Federal Election videos after being invited to share a halal snack pack by Sam Dastayari. In total, during the election campaign, 3.7 million Australians had 32 million election-related interactions (including original posts, likes, comments, shares). Shark attacks were the third most talked about topic. Coast to coast there were shark attacks and debate about what to do about it. With West Australian beaches closed in the middle on the year following fatal shark attacks, and the debate raging on the New South Wales coast, as well as in our parliamentary chambers, coffee shops and pubs about what to do to reduce the number of victims, clearly this is an issue that got Australians posting, liking, commenting and sharing in 2016. It’s the first time we have seen this topic in the top ten list since we started counting. Most Australians were still at the beach, celebrating the new year, when we awoke to discovery that one of music’s legends — David Bowie had passed away. Bowie’s passing generated intense tributes and memories on Facebook — with people remembering their favourite Bowie song, that epic Bowie concert experience, the one time they met him or saw in in person, and of course, his final farewell music video. Throughout the course of 2016 a string of celebrities joined Bowie for what can only big one of the best jam sessions in heaven, so Bowie’s passing set a tone and reference point for many of the subsequent events on 2016. On Facebook, more than 35 million people globally generated 100 million likes, shares and comments within 12 hours of his death. Australia was the second most engaged country on Facebook after the UK, ahead of Iceland, Ireland and New Zealand — suggesting that Bowie’s Let’s Dance video shot in an Australian outback pub endeared him to our hearts forever. The augmented reality game smashed all kinds of record books when it was released mid-way through 2016. Crowds gathered and swarmed to collect rare pokemons, the Northern Territory police were one of the first unwitting pokestops that had to put a sign up advising people they didn’t need to enter the police station to collect their pokeballs and there were reports of injuries as people tried to catch them all. Thanks to the ability to take photo of your pokemon catches, many people shared — not just that they were playing on Facebook — but also that time they finally caught Pikachu. and the AFL Grand Final Sports always features in the top ten lists for Australians, because we know that Australians love their sports. And this year — after 60 years, the epic victory for the Western Bulldogs becoming champions had people posting, liking and sharing the intense experience after such a long wait. The #10 Olympics rounded out the top ten list as we cheered on our athletes at both the Summer Olympics and the Paraolympics, and then debated their performances. 2016 was the year of big politics — whether it was the US Election, the federal election at home or also Brexit. Many people took to Facebook to debate and discuss the referendum on whether Britain should leave the European Union, and the aftermath of the vote to leave. 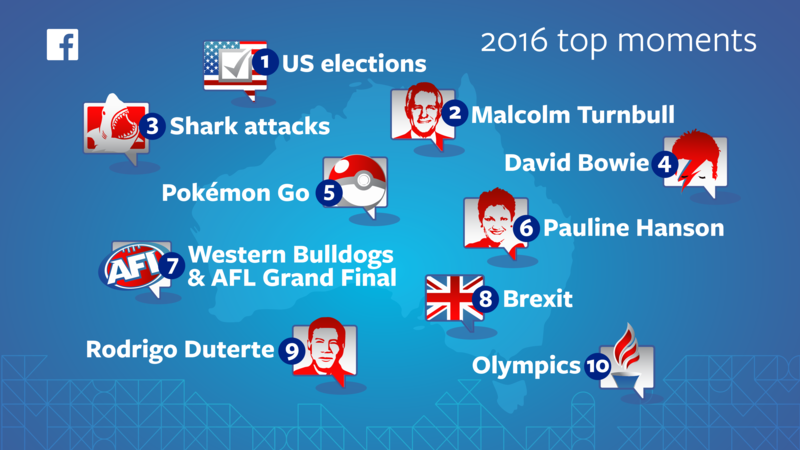 And closer to home, the President of the Philippines, #9 Rodrigo Duterte was the ninth most talked about topic by Australians on Facebook. The Philippines was the most engaged election on Facebook in the Asia-Pacific region. 25 million people were engaged in election related conversations, generating 315 million interactions. The most popular posts by our politicians on Facebook on Election Day 2016 are not what you would expect – Adam Bandt had the most overperforming (number of interactions relative to fan size) post overall but then, cutting across the political spectrum, it was photos of our politicians and their families that had our thumbs hitting the like button.